There are five parameters to the Black-Scholes pricing model for an option on a non dividend paying stock. This module shows how a series of input boxes can be used to gather the values of these five parameters from the user. 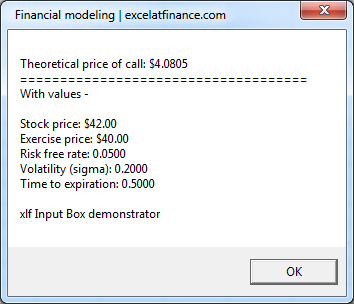 Assign the values to variables, then return the option price with a list of inputs to the user with a message box. The input boxes use the VBA InputBox method, and are presented in the form of a wizard - each box is Step x of 5. Step 1 for the Stock price is shown in figure 1. The VBA code for the input box sequence is shown in code window 1. To allow easy testing of the box sequence, the user is able to allow default values in each box by setting the switch in line 9. TRUE displays default values, FALSE disables the default value feature. The CANCEL buttons exits the procedure. When the five parameters have been entered, the line 39 passes the values to the BSCall function procedure in code 2. Line 40 to 48 of code 1 then display the message box shown in figure 2.